July 23, 2011 by Alphageek in "alphageek", "review", "urbanspoon"
July 14, 2011 We have read about Mrs. Rowe's in several different publications, and decided it was a must try while we were on vacation. They are famous for their breakfasts, so we decided to stop in and give an early morning meal a try. The first thing we noticed when we stopped in is how unassuming the place is. 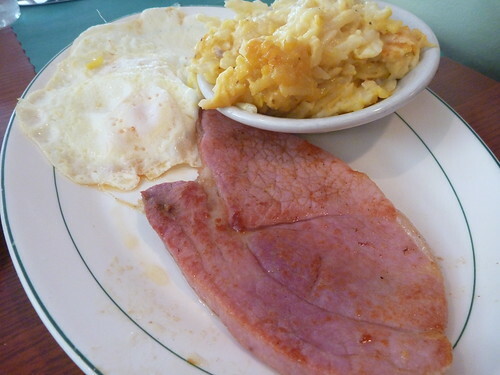 One would think that a place called "One of the Best Breakfasts in the South" would be a little more pretentious, but Mrs. Rowe's looks like many other restaurant's one drives by on vacation. We sat down and took a look at the menu. It was a traditional, straightforward kind of menu. 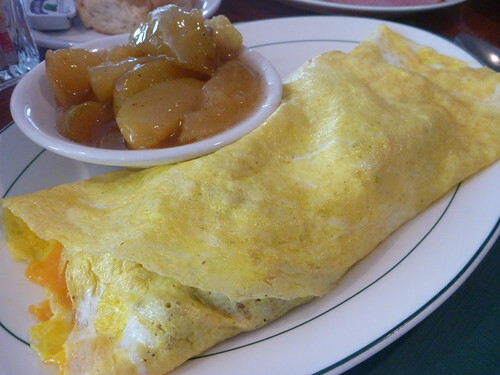 Daily egg specials, omelets, that sort of fare. Mrs. Alphageek settled on the Two Eggs with Country Ham (the special that day), while I decided on the He Man breakfast, which is an omelet with steak and potatoes inside. We ordered some coffee, and we need a quick word about the coffee. The Alphageek likes his coffee. It has to be good coffee. They serve Mawell House coffee here, which just does not get it done for the Alphageek. If you don't really care about your coffee, you will be fine. If you do care about your coffee, stick with the iced tea, which I overheard another table raving about. Our food arrived quickly, Mrs. Alphageek's dish was dwarfed by the ham steak that was on it, as you can see below. I tried a little of the ham, and it was great southern cured ham. Mrs. Alphageek seemed to like it, even though she likes a thinner slice of ham for breakfast. My meal, pictured below, was a study of simple but great food. While you can't see it, the omelet was stuffed with perfectly cooked potatoes, steak and cheese. It was as good an omelet as I have ever had, and I may make Mrs. Alphageek go back sometime, so I can get another one. The apples made for a great side dish and were not too sweet, like one often finds these days. We left with the question, is this one of the best breakfasts I have ever had? This is a tough question to answer. I can say this: I thought the omelet was exceptional, so I can't contradict those who rank this as one of the best breakfast places in the South. I would just get the iced tea next time.